There is nothing better than Smashed Potatoes for a fabulous side dish at any dinner. This variation used onions and garlic for added flavour. This recipe is going to knock your socks off! 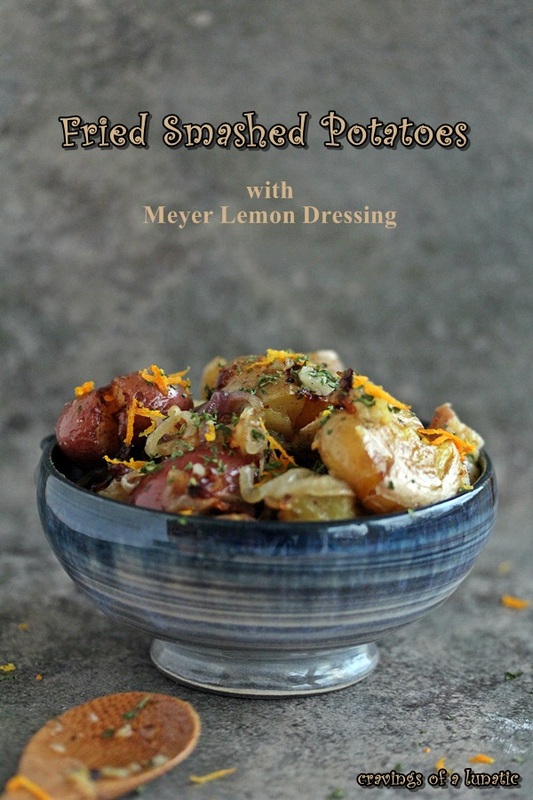 Do you love Smashed Potatoes as much as I do? I bet you do. 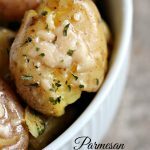 Make sure you check out my Parmesan Smashed Potatoes I posted the other day. They were amazing and you’re going to want to make them as soon as possible. 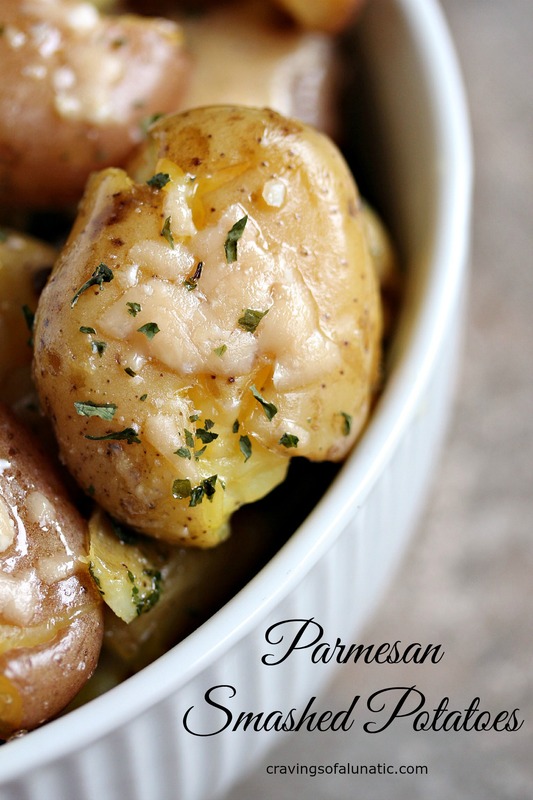 You can see those Parmesan Smashed Potatoes on the Food Fanatic website as well as on my blog. They had a cool event for Thanksgiving called Sides to Share. 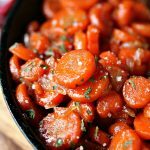 14 amazing side dish recipes that are perfect for any holiday. Let’s be honest, we all think that Turkey is the star for Thanksgiving but in reality it’s the side dishes everyone goes crazy for. I know at our house my family goes nuts for all things served on the side. I make tons of options. I have a tendency to overdo it at holidays. I typically make two kinds of meat, then about a dozen side dishes, plus various options for bread. I don’t know why but I have this overwhelming need to make as much as possible. Luckily most of what I make is good for leftovers. That comes in handy on busy nights where we all have tons going on and no time to cook. There’s days I spend way too much time at the barn and sort of forget to cook. I know, right. Who forgets to cook. Especially when their job is to cook for a living. But I’ll be honest with you, some days I get caught up playing with the horse and time just slips away from me. I never feel bad about it. Never. Horsey comes first. When I get home on those crazy days I can always pull out leftover turkey and stuffing. 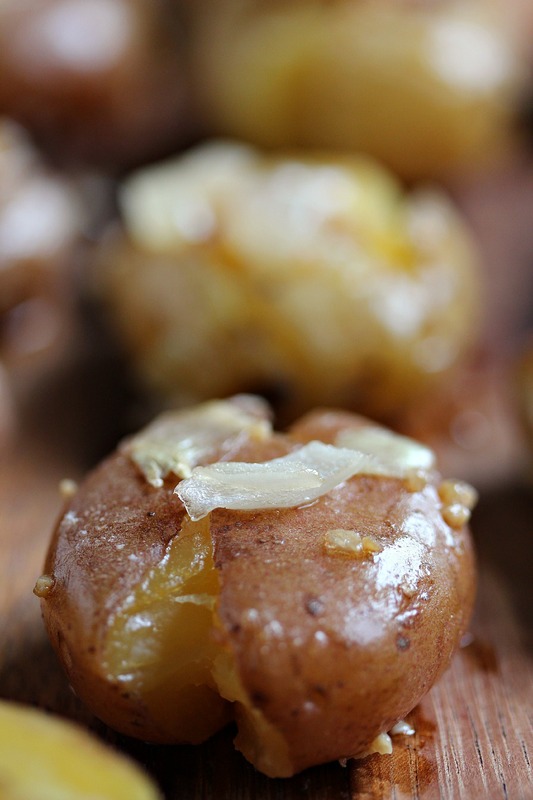 Then I can just whip up a quick batch of these amazing potatoes and everyone is happy. That works for me, and my family. They can’t get enough smashed potatoes. No matter what I’m whipping up for dinner I always make sure I have some fabulous desserts. If your life is busy like mine, or you forget to cook on occasion like I do, you can always whip up easy no bake desserts. They are such a time saver. I honestly think parfaits are perfect for most holidays or family dinners as well. They are typically easy to make and they look super impressive when you set them out. They are always a hit at my house. We eat parfaits at least once a week. My whole goal for holidays is to make as much food as possible with the most minimal effort. I love to cook but I also like to enjoy other things in life so I’m never above a good cheater stuffing recipe when necessary. Take time cooking the things you love to cook or are important to cook. Then save time on the things don’t have to cook. Sometimes we buy store bought rolls. I also order Honey Bee Hams for holidays. There’s nothing like spiral honey ham. Yum! It’s okay to cut corners when you need to. Never feel bad about it. I know so many people believe every single thing you cook or bake should be made from scratch but I just don’t feel the same way. Yes, eat healthy when you can, but don’t feel bad when you can’t or don’t want to. Life is chaotic. I pick my battles. If it’s important to me I make time for it. If it’s not important to me I don’t make time for it. I never let anyone guilt me over it. My life, my way, on my own terms. For cooking, and life in general. It’s just how I roll. Always. Now that I’ve enlightened you with that little nugget of truth I’ll shut up now and run off to the barn. Priorities, shmiorities. I like to enjoy every little moment of my life I can. And horsey hugs make my heart happy. Preheat oven to 400°F. Line a large rimmed cookie sheet with parchment paper. Set aside. Drain the water from the potatoes with a colander, and rinse them. 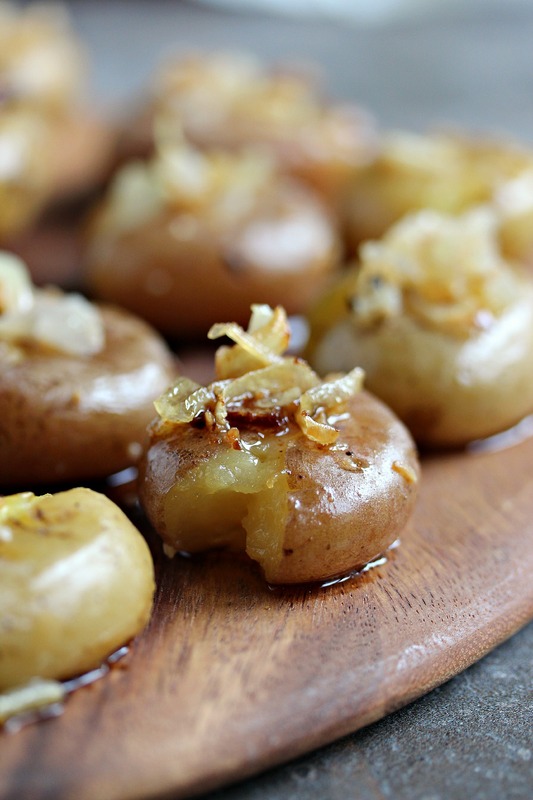 Place the potatoes on the cookie sheet once they've cooled slightly. That way they can be handled without burning your hands. Pour olive oil over top of the potatoes evenly. Toss onions around the pan too. Then drop small pieces of butter randomly around the potatoes. Toss salt and pepper over top of the potatoes evenly as well. Place the cookie sheet in the preheated 400°F oven and cook for about 15 to 20 minutes, flipping halfway through the cooking process, when you flip them at the halfway mark you can then add the garlic. This also helps move around the onions so they crisp on all sides. 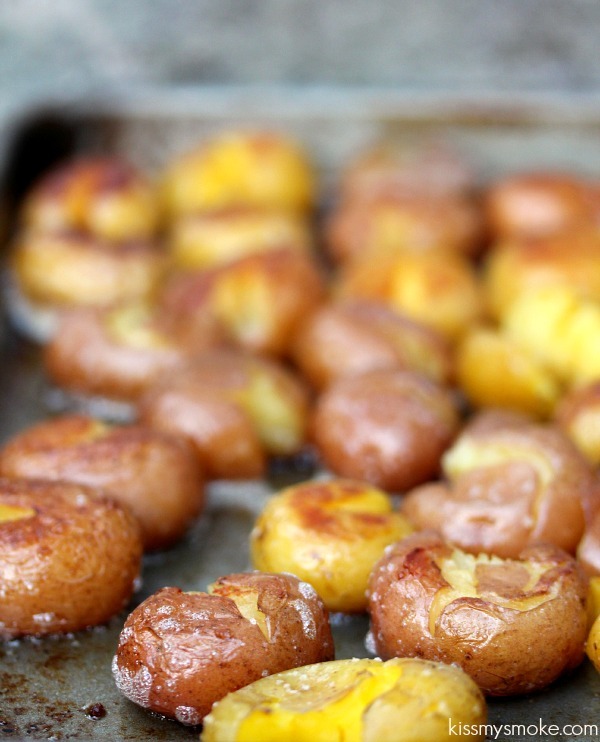 Remove from the oven when the potatoes are golden brown and crispy around the edges. 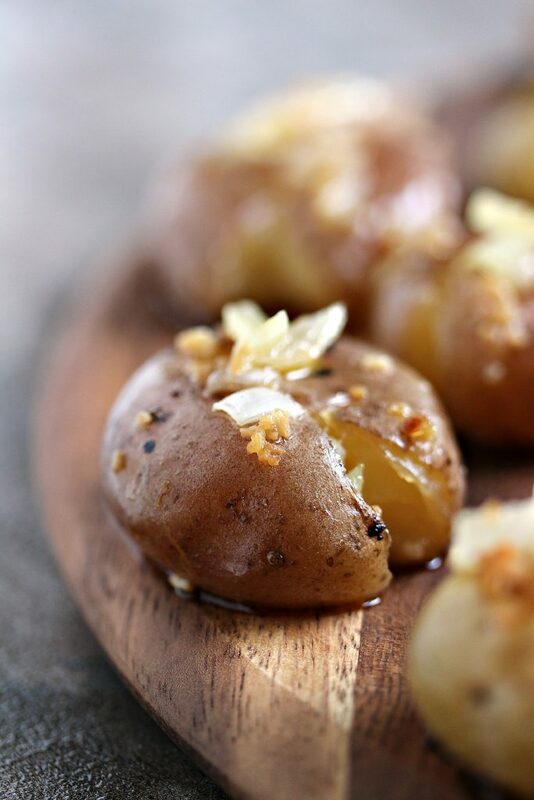 Remove the potatoes from the oven and transfer to a platter or serving bowl. Toss with more salt and pepper if desired and even more butter if you're feeling a bit naughty. Naughty is fun! Toss any garnishes you may like over top. Serve with a big old smashed potato loving smile! Whip up a batch today so you can dig right in. 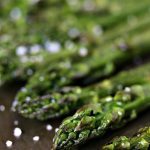 Be sure to swing by my recipe index for more great recipes. 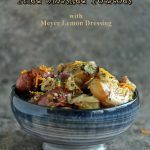 You can browse the Thanksgiving Recipes, or take a look at my Side Dishes for lots of great ideas. Thanks for visiting my blog today. Make sure you follow me on Pinterest and Instagram to keep up with what’s cooking in my kitchen. Disclosure: Post contains affiliate links. I make a small commission from Amazon on products you purchase from my store. Thanks so much to everyone who helps support the blog. 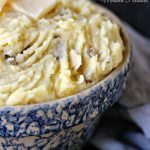 I have never tried making smashed potatoes, but obviously I need to ASAP! These look soo good. You have to give them a whirl. They are so worth it. Best potatoes ever. 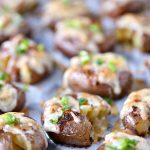 my mouth is literally watering looking at these smashed potatoes! Thanks Kayle. I love smashed potatoes way too much. Love anything potato! These look so great. Perfect for a Sunday dinner. Pinned. Visiting from Sundays at Home party. 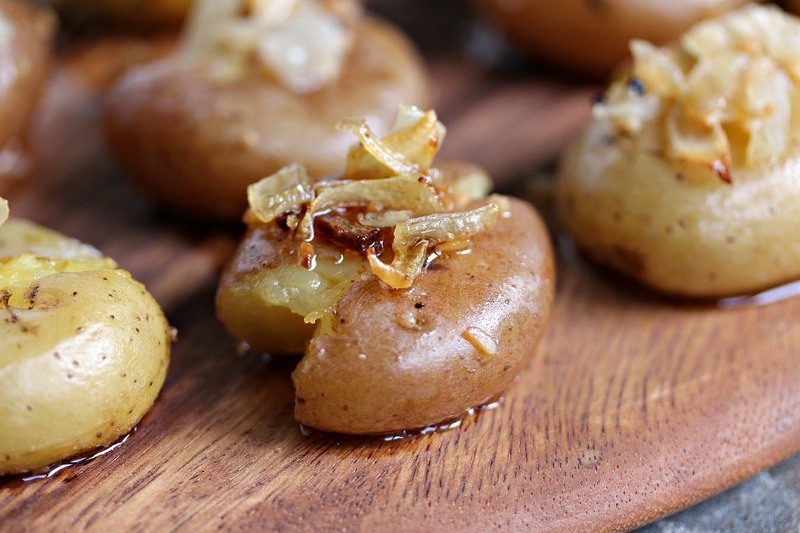 Smashed potatoes are new to me, but they sure look delicious. I’d love for you to share this at our Monday Social Party! oh i love smashed potatoes.